I love reading thrillers. 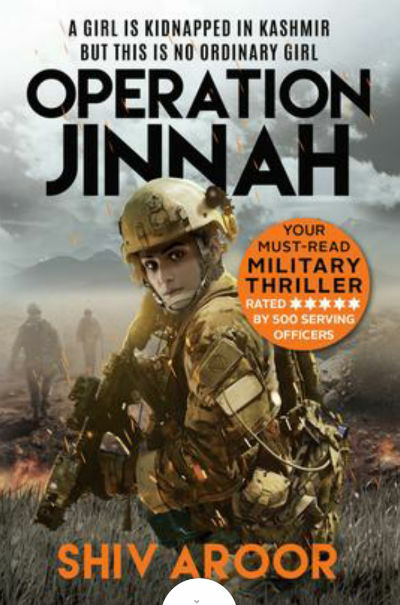 Recently I came across a book named “Operation Jinnah!” by Shiv Aroor. I’ve started reading the book without many expectations and gradually I started enjoying the way it is written. Being a reporter Shiv himself had came across many authentic details and scenarios which is explored in this fiction nicely. I read this book on Juggernaut app, and here is the cover page of the same. The cover page is fantastically designed with a female commando shown in full combat mode and a “rich with details” background. The smoothness of her face and clothes of the commando makes is taken from a Hollywood film though. Also, the colors of the commando’s suit are not matching exactly with what I’d seen so far, but it doesn’t make the cover less effective. Overall, we can consider it as an attractive cover. While, I cannot write in detail about the plot as it then will contain spoilers, revealing the story and affecting your reading experience, we will take a bird’s eye view of it. Operation Jinnah, a secret and highly classified operations by Indian armed forces to destroy Jinnah naval base of Pakistan is progressing secretly as planned. The operation was somehow called off at the very last moment. The weapons were self-destructed before the moments ahead of their strike on the target. The care has been taken that none of the tiny parts of the weapon can reveal the identity of the country who launched an attack! Leaving no proof will make you eligible to detach yourself from otherwise world known fact! A young girl named Varuna who was visiting Kashmir with her friends was so mesmerized by its beauty that she cannot think that this place could be dangerous. Like her other friends and many youths around the world, she also was connected with the social media in a “more than required” attachment! While on her way to the airport with her friends, her car was force stopped. The driver and all her friends were killed and she was abducted! The attack didn’t give her any time to react, and she could not have done anything otherwise. She was taken to an unknown destination by the kidnappers. And it was not within the country! But, why was she abducted? Is terrorism rising again in “the heaven on the earth”? But then also why a young girl like her? Or was it something much bigger, which is not known to many? Well, she is the daughter of a decorated leader of Indian armed forces. But, usually, wars happen between two armed forces or between the rule observers and rule breakers, why to drag family inside? What the leader of the terror organization (if it is behind this abduction) want from her or her father? And what is the link between Operation Jinnah and this abduction, if any? The operation was called off, so there shouldn’t be any consequences of that operation which could have lead this incident, right? Silence is Golden. And Not Just During Operations. Let me start by saying that the book is fantastic. The book touches some of the aspects in a way that other authors often doesn’t like to explore to stay away from controversies. Shiv took a brave step in that regards. It is not rare to find such examples in some of the countries through. Anyway, let us talk about this book and various aspects of the same. Being a milliary thriller, the book remains honest to the genre. The author does a brilliant job in weaving some of the thrilling incidents with each other in a nice way. His knowledge about armed forces, various terminologies used there, various innovations in the field, the way the operations are planned and executed is evident in the book. He knows how to mix various ingredients of the thriller quite effectively. These days, it is not rare to find abusive words in a book or even some forced adult readers specific scenes, this book is free of them and I like this attribute as well. The characters of Sarasvati, Akila and even Varuna at an extent shows a good example of empowered females. They are the lead characters in the book despite having other powerful people shown in the book. And the way they are treated by Admiral of Indian Navy or their colleagues like Vikramaditya, is the way females should be treated in real life also. So yes, this book gives you the idealistic representation of women empowerment. The dialogs/description serve an important role in any book. Let me take you to a ride of some interesting lines I found in the book which remained with me even after completing the book. Of course, I will try hard to keep the spoilers at the bay :). Did anyone really know what the right thing was in situation like this? A wordless acknowledgment passed between the three as they stood before the admiral. It was a question that terrified him because trusting a man he had no control over was irrational. “Stop. Stop. Don’t move a muscle,” Saraswati whispered loudly. There’s nothing as pure as revenge. If there ever were a bridge no one wanted to cross, it was this one. You ever heard of field magic? “You’ve been in the Marines, Mr. President. Surely you know that we leave mythology alone?” The prime minister smiled. ..the comrades by your side were the most valuable people you would ever know. So, now you must have got the idea about the quality of the book. The combat scenes, the chasing incidents and the mission execution(s) are explored quite convincingly. If glossary was given at the end, the book good have been more effective. A military thriller which remains true to its genre, showing the tough life the real heroes are enjoying and keep the people safe. It has the right mixture of action, emotion, drama, nicely built characters, patriotism. The research work done by the author to make the stuff convincing is visible throughout. A recommended read. Definitely 4.5 stars out of 5. Here is an interview of Shiv Aroor where he is talking about this book, especially women in combat roles.